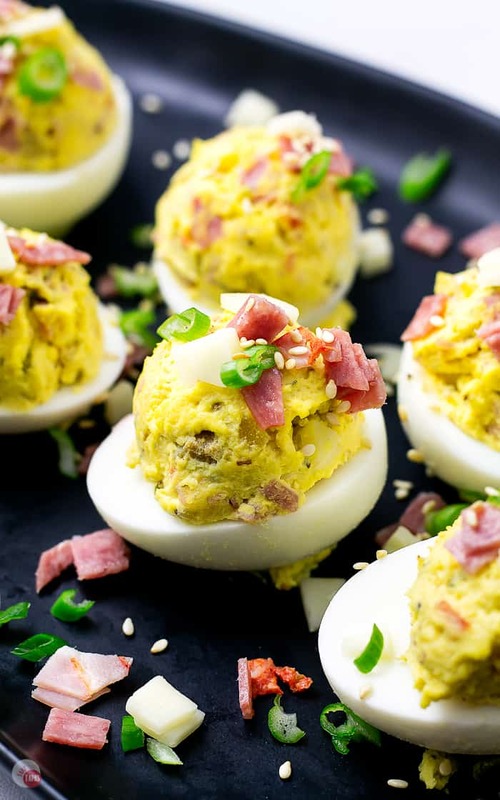 Creamy yolks, mixed with mustard, hard salami, spicy Capicola, smoky provolone cheese, and tangy olive salad make these Muffuletta Deviled Eggs the perfect appetizer for your Mardi Gras party, or any party for that matter! 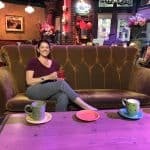 What is a muffuletta from New Orleans? It’s only the best sandwich that I have ever put in my mouth! When Brooks took me to visit his college friends in New Orleans, little did I know that I was going to be eating the sandwich to ruin all other sandwiches. If you haven’t had the pleasure of having a muffaletta sandwich, let me break it down for you. Created in New Orleans at the Decatur Street Central Grocery Company Store, it starts with a bread loaf that is called a muffuletta. The bread is crispy on the outside and light on the inside and is shaped like a flattened, large, round loaf. It doesn’t have any additional spices and seasonings baked into it other than sesame seeds. A muffuletta sandwich starts with this amazing bread loaf but doesn’t stop there. It is then loaded down with mouth-watering ingredients. 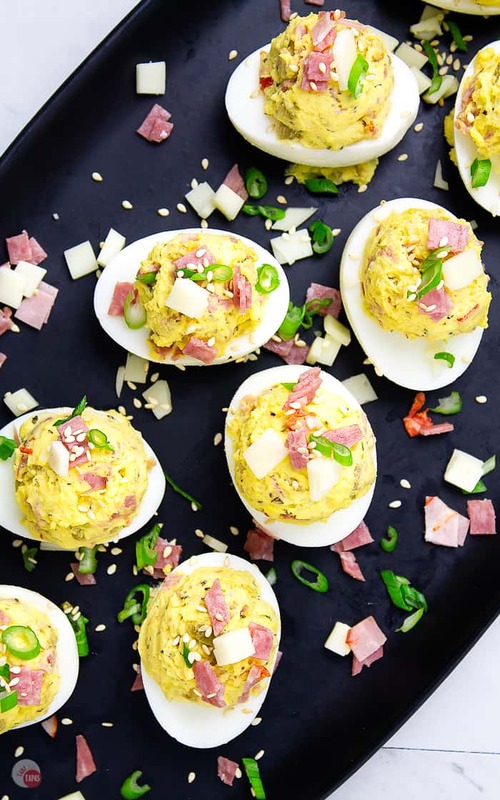 Just take me to the Muffuletta Deviled Eggs Recipe Already! 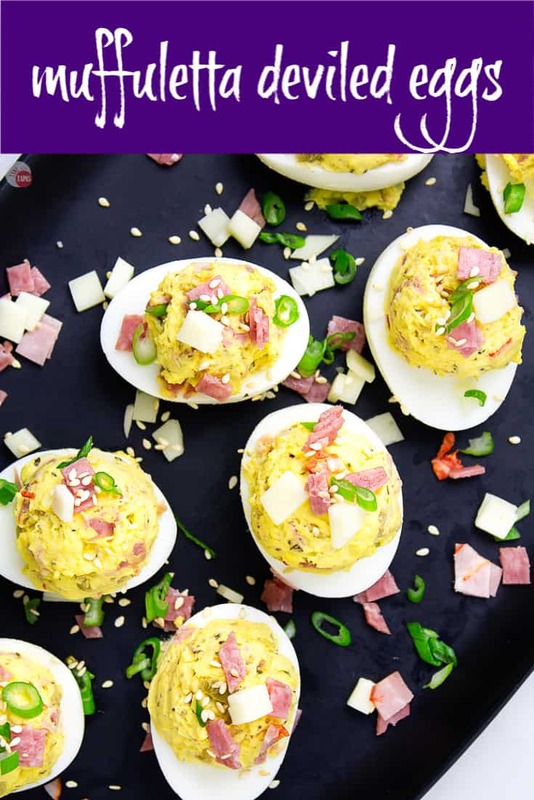 If you’d rather skip my (very helpful, I think) tips and tricks, essential cooking info, and similar recipe ideas – and get straight to this delicious easy Muffuletta Deviled Eggs recipe – simply scroll to the bottom of the page where you can find the printable recipe card. What is in the Muffaletta Sandwich? The muffaletta recipe starts with the muffuletta bread which is is sliced in half and then the magic happens. Layers of Mortadella, salami, spicy Capicola ham, Swiss and provolone cheese. On top of these hearty layers, the signature ingredient is added. A marinated muffuletta olive salad similar to giardiniera. This tower of goodness is covered with the top of the muffaletta bread loaf and sold either in quarters, halves, or a whole sandwich. I could barely finish a quarter of one even though I ordered a half. Mine was served room temperature but I have had it toasted too and it is delicious with all the cheese melted! All this goodness shouldn’t be available only in a sandwich so I decided to incorporated it into a deviled egg. This makes it acceptable to eat for breakfast because it has eggs, right?! Now that I have told you how the sandwich is made, let me tell you how to make a muffaletta into deviled eggs. Start with hard-boiled egg yolks, mix in some mayo and mustard, finely chopped salami, Capicola, cheese, and finely chopped olive muffaletta salad. Pipe or scoop the filling into the egg white halves and top with chopped salami, cheese, and some toasted sesame seeds. If you like them spicy, use the Capicola ham or add some hot sauce to the mix. Q: Can I make the filling ahead of time? A: Yes, you can. No more than 24 hr as it will start to get watery from the olive salad. Q: What can I use if I can’t find Capicola? A: Feel free to use regular sliced ham but I would add a few dashes of hot sauce to the recipe to replace the spice. Q: Can I use mortadella like in the original sandwich recipe? A: I love to use mortadella when my local deli has it but I can’t always get it so I opted for ham. Q: How long will the eggs last once I make them? All the delicious layers of the classic New Orleans sandwich combined with hearty eggs make a great appetizer for Mardi Gras, Fat Tuesday, or any celebration! Round these out with a King Cake Oreo Truffle or two! 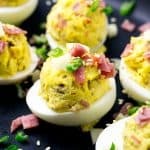 Other great deviled egg recipes to try! Looking for great party food to take to a party you’ve been invited to? How about a quick appetizer you can make ahead of time for a get-together that you are hosting and are already stressed to the max? Check out all my cheese ball recipes, both sweet and savory, to fit your special occasion! 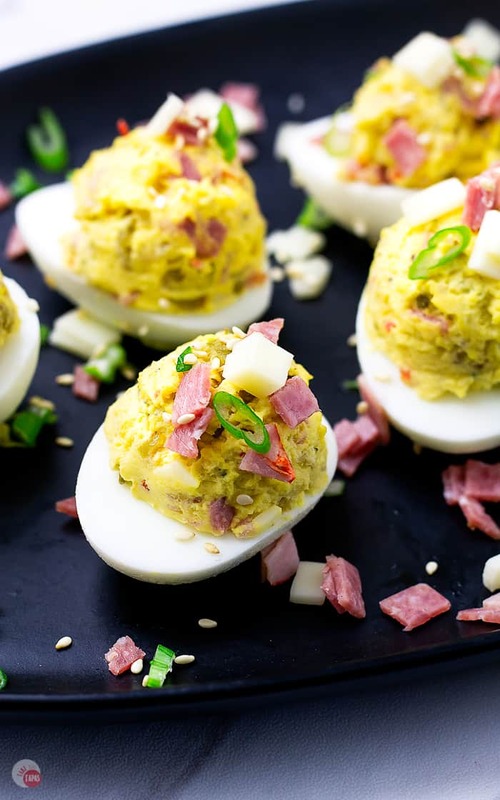 If you love this Muffuletta Deviled Eggs Recipe as much as I do, please write a five-star review in the comment section below (or on Pinterest with the “tried it” button – you can now add pictures into reviews, too! ), and be sure to help me share on facebook! 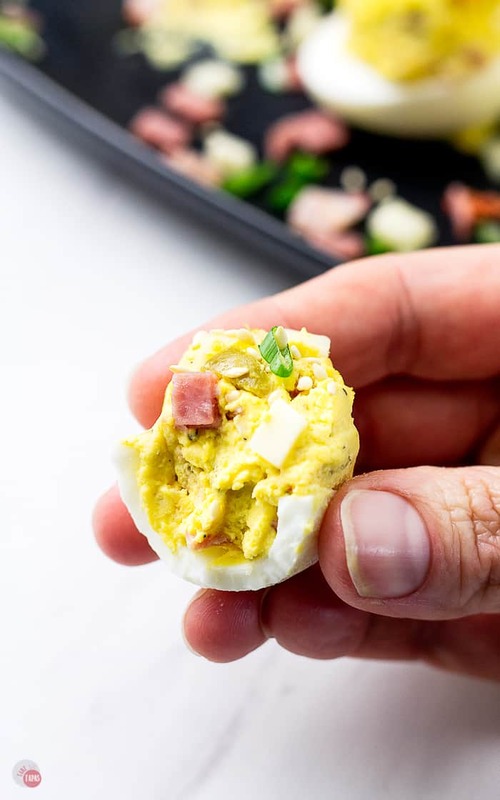 Creamy yolks, mustard, hard salami, Capicola, provolone cheese, and olive salad make these Muffuletta Deviled Eggs perfect appetizer for Mardi Gras! Slice the eggs in half and remove the yolks to a mixing bowl. Add the mayo, mustard, oregano, garlic powder, salt, and pepper. Chop the salami, Capicola, and provolone cheese into small pieces. Fold the chopped meat and cheese into the yolk filling reserving a little for garnish. Finely chop the olive salad. Fold the olive salad into the mixture. Using a spoon or small ice cream scoop, fill the empty egg white halves with filling. Garnish with chopped salami, cheese, and sesame seeds. These deviled eggs are amazing!! Love all the flavors. Such a fantastic little bite.